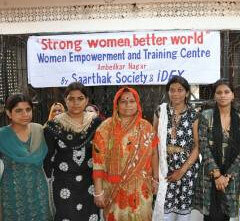 SAARTHAK is a non-profit organization based in Jaipur, Rajasthan. SAARTHAK believes that women / girl child centric initiatives are the key to sustainable development, fighting poverty by unlocking women’s power as economic catalysts. Therefore, the focus of the organization’s initiatives is on women and girls empowerment, quality education, and capacity building: from Non-Formal-Education (NFE) to awareness raising and vocational training. With these initiatives, SAARTHAK enables the women to help themselves, bringing change to their life as well as to future generations.